A friend of mine, the mother of two rambunctious boys, wanted to preserve her memories of their infancy by re-purposing the bedding from their former nursery. She bravely turned over to my care their crib sheets, bumper pads and dust ruffles and asked me to do my thing. I got to work on a new keepsake quilt straight away, tearing apart seams, removing batting and squaring up the remnants. Four coordinating prints were used to make the original bedding, I kept these pieces as intact as I could and reassembled them into a quilt top and back, each of which I supplemented with matching Kona solid sashing and borders. 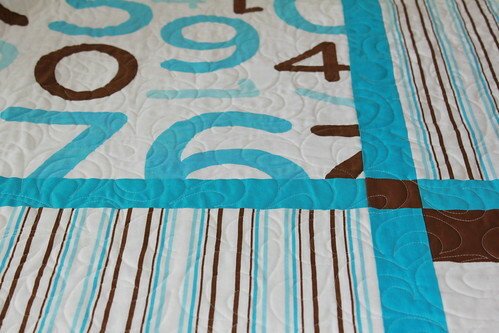 I used white thread and a whimsical swirl pattern for the quilting. My friend requested that I use the original bumper pad ties for a "taggie" type of edge treatment. It took me a little while to engineer this but I think it worked out well; a sort of tag / binding combination. I can't wait to deliver the finished quilt to my friend. I know that she will be pleased to have this practical, useful keepsake for many years to come. From bedding sets and duvet covers to sleeping bags and mattressess, find 1000s of products to help baby sleep tight in http://www.bespokebabybedding.com Bedding Store.